Hatters midfielder Jordan Cook is a big doubt for this afternoon's League Two trip to Mansfield Town. 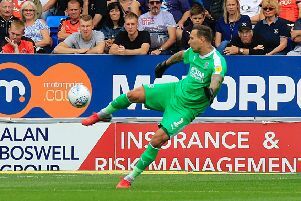 The 27-year-old saw his return to the starting line-up against Leyton Orient on Friday ended after just 24 minutes when had to hobble off after a heavy sliding challenge. Speaking afterwards, assistant boss Paul Cook said: “There’s a slight twist, but we’ll know more tomorrow and on Monday. “He’s just came back in and we said straight away with the sort of tackle as he was flying down there, there may have been a problem. Ollie Palmer is available to face one of his former sides this time, after missing the O’s clash due to the terms of his loan, while on fellow forward Jack Marriott, who was also handed an opportunity on Good Friday, Hart added: “Jack’s had a long time out which I think contributed to a little bit of staleness. Hart is well aware that only maximum points will do for his side this afternoon in the race for the play-offs, after a thoroughly frustrating 2-2 draw with the struggling O's, adding: "It’s disappointing, but that’s what you have to put with, move forward, we've got a quick turnaround now, the boys are a little bit disappointed, but we'll be fine for Monday. “We’ve got to win. Our aim was to win both games over the Easter period, and a win on Monday will make it look a good. Like every game, we’ll approach it to win, it’s clear what we have to do, so we’ve got go up there and get it sorted."